I have been keeping my eye on this beer for a while now gathering little pieces of info here and there. 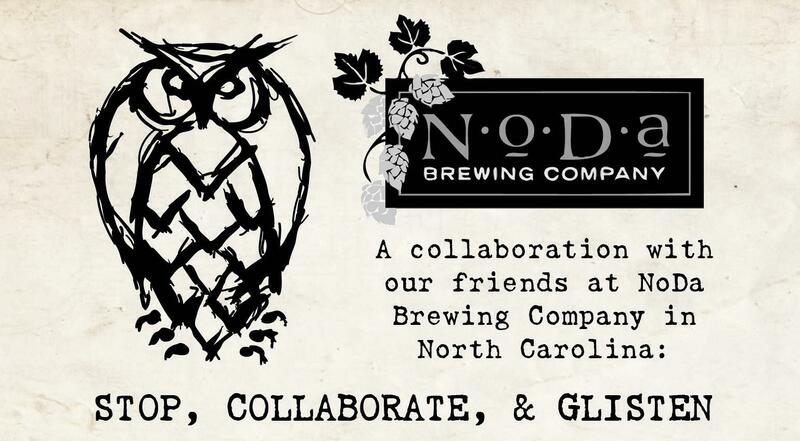 Talking with Todd (owner of Noda Brewing) and Chad (head brewer at Noda) trying to squeeze as much info out about this beer as possible. Here is some info about this awesome collaboration! 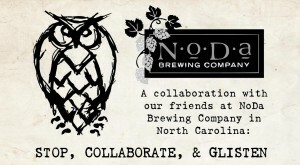 About a year ago NightShift approached Noda for a collaboration beer and the rest was history. Noda gladly accepted and flew Chad up to Noda for a brewing session. After talking with Chad, he said it was one of the hardest brew days he had ever had. Chad said that they had to brew 2-3 times to make the same amount as Noda does in a single brew session. Well hard worked payed off. The beer they came up with is a sparkling golden ale fermented in wine barrels with sauvignon blanc grape must and a blend of wild yeast strains. This 8.9% beast sounds delicious! The barrels were housed at NightShift and were slated to be for the May Festival up in Boston. We were unable to make it up to the festival but heard from a few sources that Stop Collaborate and Glisten was a home run! These two fast growing breweries are independently making a name for themselves, I wouldnt expect anything less then amazing from a collaboration. NightShift, to our surprise, has announced that they will be bottling this collaboration and it will be their FIRST bottle release at the new facility Thursday June 12th.